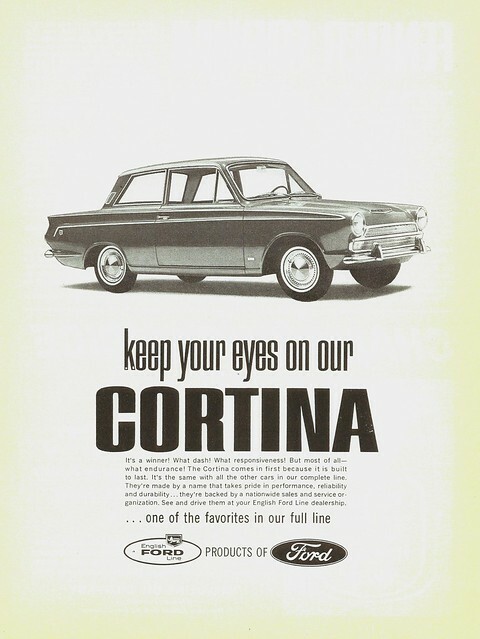 The ad that introduced the Cortina to the USA in 1963. The Mk I Cortina was a rally winner and the EFLO made sure that Americans know about it. U.S. English Ford sales fell from a high of 42, 413 for 1959 to just 3,888 for 1963. 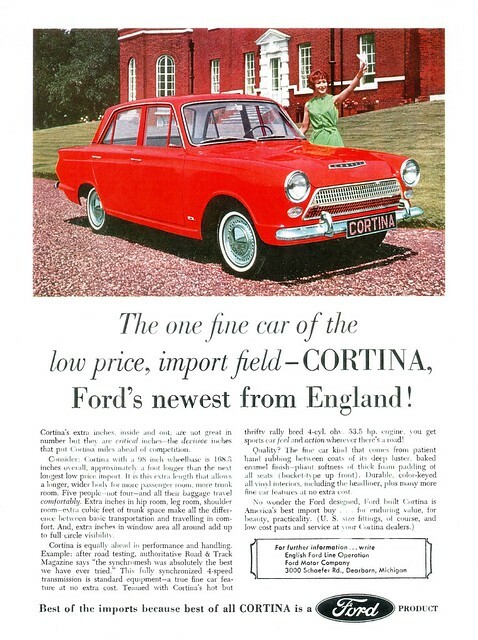 However the Cortina was helping to turn things around and a total of 4, 208 English Fords, mostly Cortinas, were sold here in 1964. 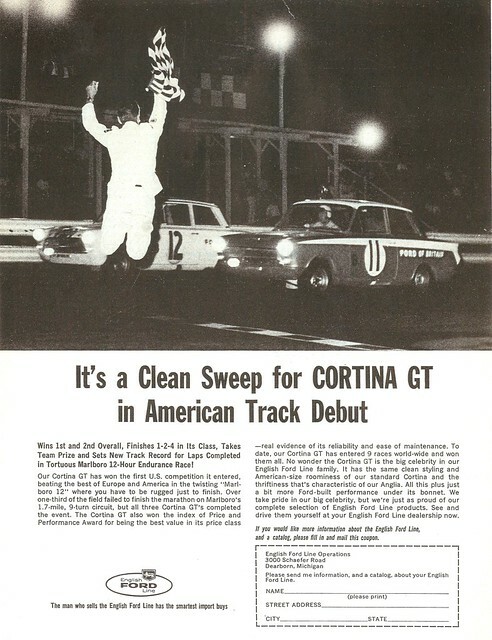 1964 Cortina GT: A historically significant advertisement, the Cortina GT's 1 - 2 - 4 win at the Marlboro 12 Hour in the summer of 1963 put the Cortina GT on the map for American sports car enthusiast. The First place car was prepared by Willment and driven by the team of Sears/ Oltholf and the Second place car was prepared by Alan Mann and driven by the team of Blumer/Taylor (per Graham Robson's book "Ford in Touring Car Racing: top of the class for fifty years"). 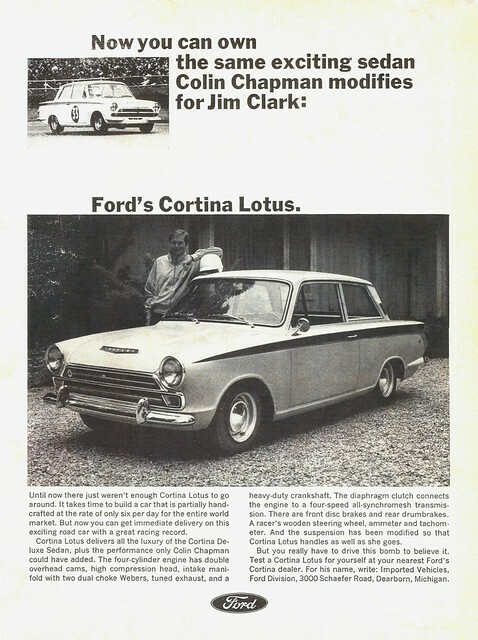 The legendary Cortina Lotus (this was the official name), was offered in the USA for only model year -- 1966. As the ad says, these were limited production cars. A total of only 3,301 Mk I Lotus Cortinas were built, about a third of them in 1966. 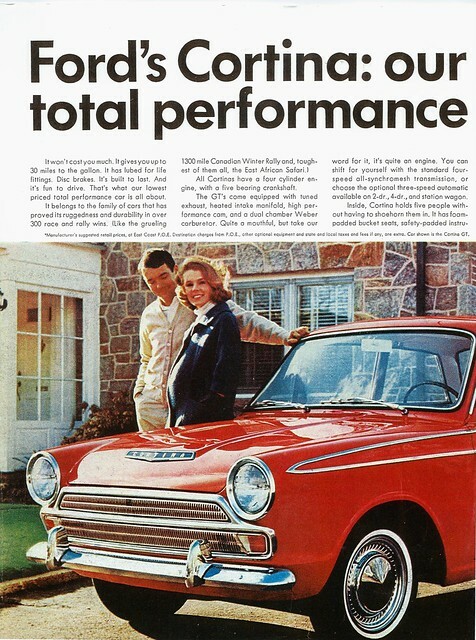 One unique characteristic of the US spec Cortina Lotus was the use of the standard full width bumper instead of the iconic quarter bumpers used elsewhere. Dating from late 1965, this is a historically interesting ad as it is the last one to feature the English Ford Line logo. 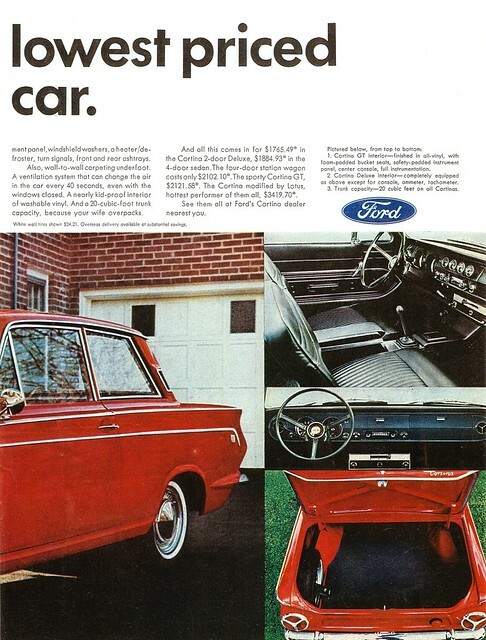 In 1966 the English Ford Line (which at this point consisted of the Cortina and the Anglia sedan and van), was absorbed into the Ford Division. 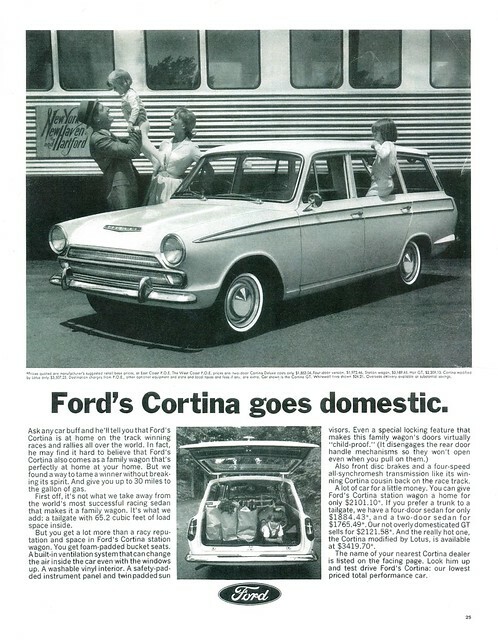 1966 was the first year that a Cortina station wagon was offered in the USA. 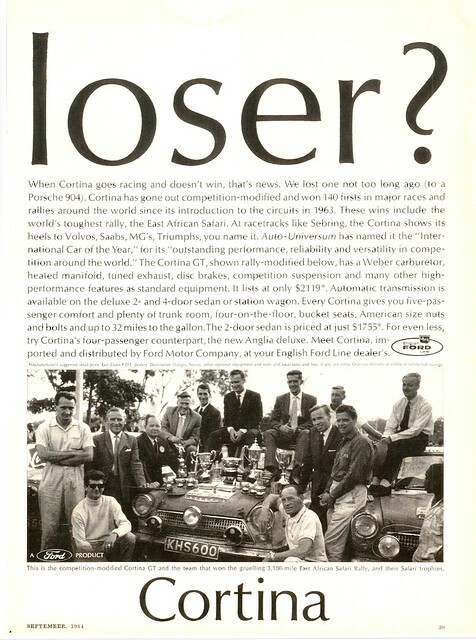 Great adverts, I still remember when my Father was contemplating buying a Mk1 Lotus Cortina in 1966. There was a lot of brochure material around the house in those days, he ended up buying a red GT just like this car. Like the "our total performance" dig at Mopar.